There’s a school of though that argues you should plan before you shop for food, that it’s best to have decided what you intend to cook and then only buy from your ingredients list. While it’s true this approach may help minimise waste and keep spending in check, there is no room for spontaneity, and no delight in the temptation of beautiful fresh produce. It’s cool, calculated and controlled. I am none of those things. Seasonal awareness may influence my planning and dictate what’s written on my shopping list, but I like the unpredictability of buying ingredients on impulse. If there is a glut of tiny sweet strawberries, we eat tiny sweet strawberries, if juicy ripe tomatoes are so plentiful that the grower is almost giving them away, we eat tomatoes, and if the fisherman’s catch includes large fresh green prawns, we eat prawns. In a seafood market dominated by cheap frozen imports and farmed products, it was impossible to resist a kilo of wild green prawns that had been pulled from Moreton Bay the day before, prawns that were fresh, never frozen, prawns that were reasonably priced, almost cheap. It seemed right to cook the plump green prawns with tomatoes and peppers after all, they too are at their best in the early days of autumn and choosing a quick cook saute suited the heavy humidity of the day. This is not a curry dish with a soupy sauce, but a funky riot of pan charred sweet peppers, sweet prawns and spice. All have equal importance. The complex flavours in this dish shone brilliantly so I kept the prawn curry accompaniments simple. A bed of sweet and spicy carrot pilau and a side salad of crunchy kachumber laced with coriander. I drew inspiration for this dish from royalla vepudu, an Andhra – style prawn fry recipe from The Indian Cookery Course by Monisha Bharadwarj, a book of Indian food I highly recommend. I have unashamedly posted a number of recipes recently featuring fresh sweet red peppers, the season continues. Peel and devein the prawns. Reserve the prawn shells to make a batch of stock for the freezer. Run a small knife around the back of the prawn to butterfly. Set the prawns aside in the fridge. Cut the flesh from the peppers, discard the seeds and membranes. Juilienne the pepper flesh and set aside. Chop the tomatoes and set aside. Heat a large saute pan over a high heat. Add the oils and the mustard seeds. As soon as the mustard seeds begin to pop add the fennel seeds and curry leaves and cook for a few seconds. Add the peppers and reduce the heat to medium. Saute the peppers until soft and sweet. Stir through the grated ginger. Add the turmeric, asafoetida, chilli, tomatoes and water. Return the pan to the boil then cook for 3 minutes until the tomatoes are pulpy. Add the prawns, stir them through the sauce, then cover the pan and cook for 5-6 minutes. Taste the sauce and adjust the seasonings. I do a mix of planning and spontaneity. If I only do the spotaneous, I will too often make the same stuff over and over. Which my husband wouldn’t mind, but I like variation and besides I would quickly run out of stuff to blog! But if I see something great or on sale, I will pick it up and change my plans. Except for a brief spell after a short business trip to India, I never cook Indian food. The Oriental shops around here are mostly Chinese or Indonesian, so I’ll have to see if they carry the Indian ingredients. Unlike close by UK, we don’t have many immigrants from India around here. I thought Australians always refer to sweet peppers as capsicums, but you are probably being considerate towards your international readers. My boys (and myself) would love this, will check out what the local seafood joint has going in prawns tomorrow. That’s exactly how I shop too Mrs R.
Excellent dish Sandra. Lovely to see the fresh flavors. I’m loving the cooler weather Sherry. I guess I’m writing for the worldwide audience, Aussies are adaptable but some of our friends from over the pond are unfamiliar with our lingo. I hear myself sounding like my parents too especially right now with Miss 15yr old trying to be a vegan grand daughter in residence. Very testing…..
Am quite envious of you and Ron: when you live at the ‘end of the line’ rurally you have no choice but to have the most detailed plans in place or otherwise you are missing something until next month’s on line shop ! Anyways must admit I am one of those ‘planner’ ones by nature but do know my seasonal foods well 🙂 ! Absolutely love this prawn recipe, especially the use od fennel and mustard seeds and my beloved asafoetida (hing) . . . the Easter prawns will be bought with you in mind ! I hear you Eha, we were country folk when our kids were young and it was a long drive in the car if you forgot the milk. The swings and roundabouts of life…. Your prawn dish sounds smashing. I like spontaneity when shopping as well, especially our fresh veggie open market. We stroll through and get inspired by some lovely produce then head to the fishmonger truck. We spot our seafood of choice and start thinking about how to honor it. What a lovely dish. and a lovely post. I have yet to figure out if what I’m growing are truly curry plants. 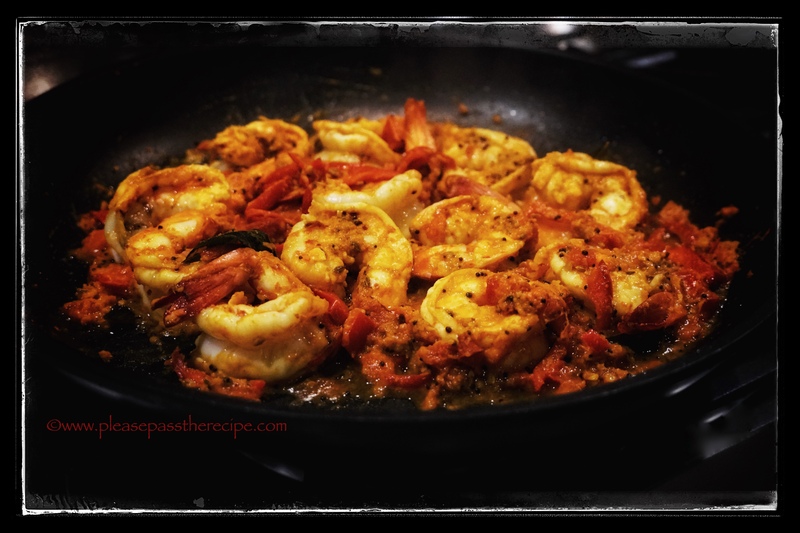 This entry was posted on April 11, 2019 by ladyredspecs in Cooking, FODMAP diet, Food, Gluten Free, Indian Food, Light Savoury Dishes, Main Meals, recipes, Seafood Dishes and tagged FODMAP diet, Indian Food, prawns, red peppers, spice. Please Pass the Recipe by Sandra Gay is licensed under a Creative Commons Attribution-NonCommercial 3.0 Unported License.